In 2014-15 we restored an organ belonging to the Collectie Gerard Verloop. It must be one of the last organs to have been made in the classic 18th century style, but expanded to include some of the features of the latest contemporary church organs. To see details of a more up-to-date chamber organ, our restoration of a 1864 Bevington organ will be posted in April. William Pilcher was not a full-time organ builder, dealing in other instruments as well as organs, and in this instrument it looks as he had exceeded his abilities, or at least, his ambition with this complex instrument was not matched by his craft skills. It is evident that Pilcher used elements from other organs. The two keyboards follow piano-making practice. They slide into the case. The keys are weighted so that the tails drop onto a rail, and they can be slid into the case under the stickers. The couplers (including Great to Pedal and Pedal to Great) offer further complexity. It is nonetheless a very attractive musical instrument. Amongst its attractions is the completeness of its history, which Gerard Verloop has covered very fully in an issue of the magazine which he published, de Mixtuur no67 (December 1990). The organ was made by William Pilcher in 1850-1 for Miss Eleanora Grant Macdowall, for her home in Baker Street London, later moved to Hanover Lodge, a large villa near Kensington Gardens. In 1946 the organ was given to Westfield College London, one of the first university colleges to admit women. In 1980 the organ was sold to Gerard Verloop, made playable and moved to Noord Holland. 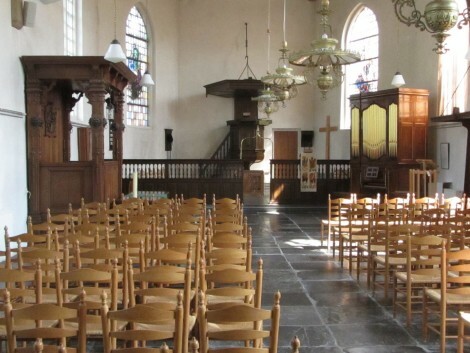 It now stands in the Koogerkerk in Zuidscharwoude (see picture), where it is used for concerts and the monthly Bach cantata services http://www.koogerkerk.nl/index.htm. The organ has been altered slightly over the years. The original Swell Celestina was replaced by a Vox Angelica using the same pipes but sharpened to turn it into a stop beating with the Dulciana (perhaps by August Gern in 1898). It has now been replaced with a Victorian Clarinet, though the original pipes (which are in store) can be put back if desired. In 1946 a 30 note pedalboard was added and the pedal stop completed with a toeboard and treble pipes. A new pedalboard has now been provided to the original form and compass. There is a general swell front which does not completely enclose the organ and makes some of it impossible to tune; it has been removed and is stored in the church. The wind chest with its two manuals and shared bass has been restored. The sliding double keyboard, and the key and coupler actions, have been restored. Sense has been made of the complex composition pedals. New parts have been made for the casework where they were missing, and the front pipes re-gilded. The metal pipes had been cut down and tuning slides added; they were extended and tuned to Thomas Young’s temperament at a¹=440Hz, which must have been close to the original pitch.